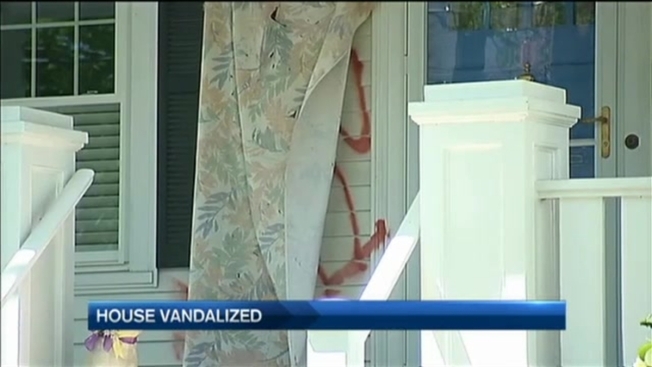 Police in New Hampshire, are investigating overnight vandalism that left a Portsmouth home covered in red spray paint and eggs. The vandalism happened at the home of a woman who has spoken out publicly against changing the colors of graduation robes. Police won't confirm the connection, but students say they're sure that's why she was targeted. "I think it is a little too far and ridiculous," said Portsmouth High School Senior Brianna Croteau. Several students necn talked to Thursday were upset to see the photo of their classmate's home covered in hate-filled words and eggs. "No one should take it to that extent, it's not worth it," said PHS students Kayla and Melina. "It was one of the boys in my grade, his mom was handing us out protest sheets against new gowns," Croteau explained. The homeowner on Aldrich Road, Beth Ricci, is opposed to the new PHS graduation gowns unveiled this week. The new unisex gowns break a decades-old tradition of girls wearing white and boys wearing maroon. The change has divided the community. "It's definitely more fair for people who don't want to be defined by their gender I guess," said PHS graduate Stephanie Kamakas. "It just breaks my heart to see tradition thrown away," Ricci said earlier in the week, according to the Portsmouth Press Herald. Police won't confirm the vandals targeted Ricci's home because of her stance on the gowns, but they are considering that possibility. "There's other ways to get your message out there if you disagree with someone else's topic," said Portsmouth Police Sgt. Chris Kiberd. Students, however, are convinced some of their fellow classmates are behind it. "It's sad to see people fighting as much as they over this little issue," Croteau said. "Just stick with gowns, it's a one day thing, let's just graduate and go out with a bang." The superintendent would not talk to necn about the vandalism and Ricci could not be reached for comment. Police say the suspects could face misdemeanor mischief charges.